Thousands of protesters have rallied in central Warsaw chanting "Shame!" after Poland's president granted the nationalist government more power over court appointments. Many held candles and pens symbolising President Andrzej Duda's readiness to sign the controversial legal changes. It is now easier for the government to appoint a new Supreme Court chief. In an unprecedented move, the EU Commission is investigating Poland for allegedly undermining the rule of law. 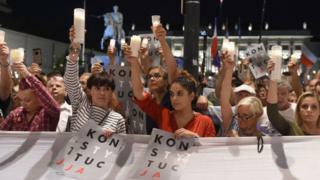 Many Poles and human rights activists accuse the government of politicising the judiciary, weakening its independence. Reute rs news agency reports that police used pepper spray during some scuffles outside the presidential palace in Warsaw. Protests also took place in more than 20 Polish cities and towns on Thursday evening against the ruling Law and Justice (PiS) party's court reforms. The PiS argues that Poland's judiciary was not properly reformed after the end of communism in 1989 and that the courts need to be fairer and more efficient. For more than a year there have been "Chain of Lights" demonstrations demanding judicial independence. Under the PiS shake-up of the judiciary, about one-third of the Supreme Court's 73 judges have been forced to retire early. But the Supreme Court chief justice, Prof Malgorzata Gersdorf, has refused to leave her job. The EU's top court, the European Court of Just ice (ECJ), on Wednesday backed the European Commission's criticism of the Polish reforms. The ECJ accepted an Irish judge's argument that a Pole should not be extradited to Poland if his right to a fair trial was in doubt. A European Arrest Warrant was issued for the Polish suspect, accused of drugs offences, but the Irish High Court feared the case could be compromised by a lack of judicial independence in Poland. The ECJ ruling provides a legal basis for EU countries to reject Polish arrest and extradition warrants. Relatives of missing soldiers have waited years to be reunited with the remains of their loved ones. Quiz: What is 7pm the peak time for?